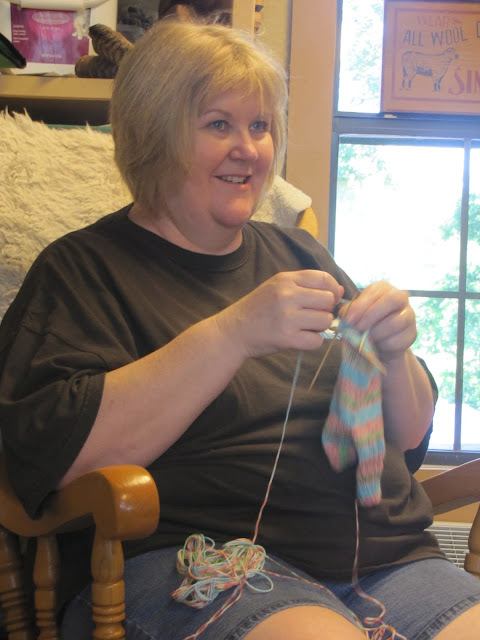 Thank you to Dina, who hostessed the Third Saturday Spin/Knit In at the Little Red Barn today. I got to attend the baby shower for a very dear friend of mine in the morning, and couldn't be both places at once (still working on that). She did a terrific job making everyone feel at home until I could get back to the LRB after lunch. And not only is she a great hostess, but she has turned my hand spun yarn into a gorgeous scarf! 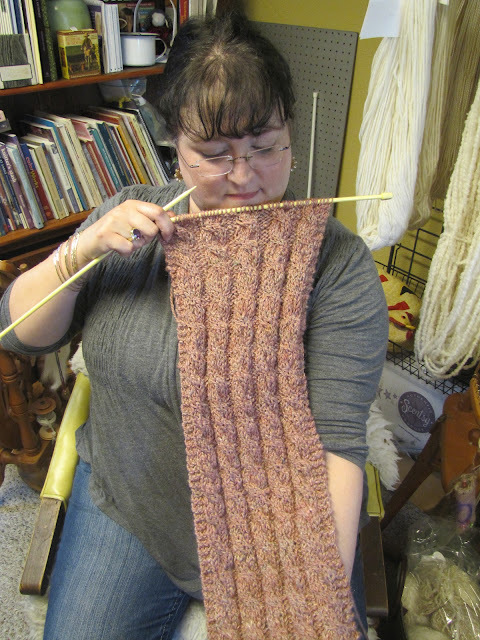 She bought this sparkly pinkish yarn at our Big Barn Sale a couple of weeks ago, and has given it a life and a purpose beyond just entertaining me while I spun it. That is awesome, and it makes me smile all over. It has new dignity, too -- I was calling it Barbie Barf, but she has re-named it Ashen Roses. Dina's so classy. Elizabeth and Hanane, who I met at the DFW Fiber Fest. Kris visits with Ashley, who's just back from her honeymoon. Smokey, dead to the world. Dina and Peggy - no heat will keep them from their wool and mohair. 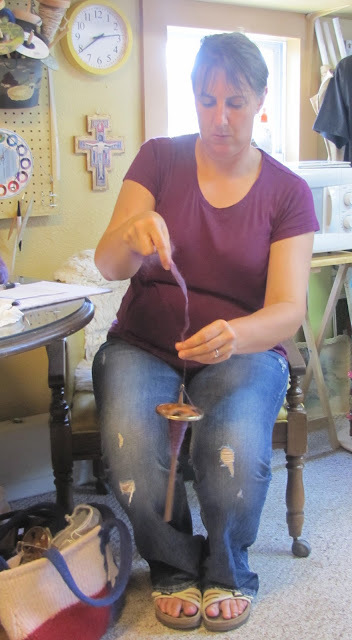 Kris gives her Golding spindle a spin. Elizabeth admits to finding some hand spun yarn on the sale table. Jill came back to the barn after a long absence - welcome back, Jillers! Next weekend, we gather at the LRB again - hopefully with cooler temperatures inside than out. I'll also be doing a presentation on Landscaping with Native Plants, if you'd like to join us for that at 10:30. Just let me know so I'll have enough materials for everyone. Summer in Texas isn't so bad - if we spend it having fun together!